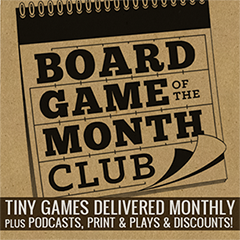 A little while ago, I got an email from Victory Point Games suggesting that I was absolutely sick of reviewing games, but that their games could restore my joy in reviewing! I thought that this email was hilarious, but I decided to take them up on their offer. Since I didn't know much about their games, I went on Board Game Geek and looked for what seemed to be popular. 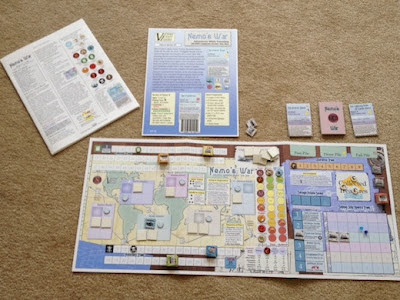 And so, I wound up with my very own copy of Nemo's War to try out. Nemo's War is a solo game based on Jules Verne's novel Twenty Thousand Leagues Under the Sea, and you play the role of Nemo captaining the Nautilus. Throughout the game, you can search for treasure, fight ships, and fight imperialism. On each turn, you start by rolling two dice. Based on the dice rolled, you place a new ship in two different oceans (or if you roll doubles, you replace a treasure). Also, if you roll high enough, you draw an adventure card - which is either a test for your ship, or a bonus that you can use later. After this setup, you select an action for the Nautilus - it can Move, Incite rebellion, Search for Treasure, Stalk or Attack an enemy ship, or Rest/Repair/Refit the Nautilus. After this action, the year marker is advanced, and the next turn begins. This cycle continues until you have completed a year (each turn represents one week), you have encountered the Maelstrom, or you have encountered one of the other end of game conditions. At this point, you calculate your score to see how well you performed. The first thing that I liked about Nemo's War was the concept of "exerting" resources. Essentially, what you can do is bet a resource before you roll dice for various actions (like attacking a ship). Betting this resource gives you a bonus to your die roll. If you then succeed on the die roll, you don't lose anything; but if you fail, you lose the resource that is exerted. 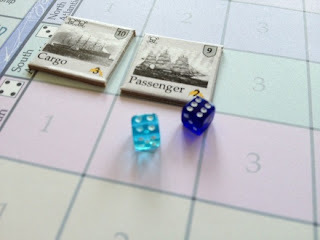 Not only can you do this before the die roll, but there are also three once per game resources (passengers) that can be sacrificed for a bonus after the die roll - but, if you use these, you lose several victory points at the end of the game. This exerting mechanism was very interesting to me, as I don't recall seeing anything like it in other games. The next thing that I enjoyed about Nemo's War was that Nemo had four different possible motivations in the game. You start the game by picking a motivation, but it can change once later during the game (after you've done several turns and you can see what you actually want to score bonuses for). Based on this motivation, you score points differently at the end of the game. If his motivation is war, you get extra points for sinking warships, but nothing for science or wonders. If you are exploring, then you get less points for sinking ships, but you get a lot of points for wonders. These different motivations force you to implement different strategies, and this allows the game to stay fresh longer. With those pros, I also had a few cons with Nemo's War. First, I would say that there was waaaay too much dice rolling. In the same way that people say Monopoly is all luck-based because of the dice rolling (which I disagree with), I think that Nemo's War has the same kind of "plan but hope" element (a term that I just made up). If you roll well, you will do well; if you roll poorly, you will fail miserably. Here's an example of how much dice rolling you may have on a turn. You roll two dice to determine if you have an adventure (and where ships appear). You roll high enough that you have an adventure. Your adventure is a test - so you roll two dice to see if you succeed or fail. Since you fail, you choose to sacrifice your Conseil once per game resource to roll again. Next, as Nemo's Action, you choose to Rest. You roll one die (and cut the number in half) to see how many weeks you spend resting. Next, you roll a die to see if you were successful at Resting. Now, your next turn begins. 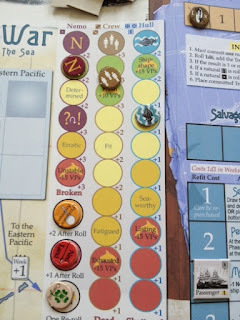 Now, admittedly, this is an extreme example (though you can roll even more dice on your turn if you are attacking repeatedly - especially if you encounter warships that attack you before you shoot back! ), but since every one of Nemo's Actions except for moving the Nautilus requires you to roll dice, you are basically always rolling dice for one thing or another. The next con that I had for Nemo's War was that the game felt very fiddly. Though, I think that there were two main aspects that annoyed me with their fiddliness - the year tracker and the resource exertion. I was always doing something with one of them. Every turn the year tracker advances. That's fine - it's a turn order tracker. However, each turn, after you roll to determine if there is an adventure, you will quite possibly have to flip the tracker. If you are exerting resources, you are supposed to move the resource down slightly to indicate that it's exerted - and if you succeed, you move it up, if you fail you move it down. I generally forgot to do this, and left it moved slightly down until I failed, and then moved it the rest of the way down. After all, I normally wanted to continue exerting the same resource until I lost it. Overall, though, you are constantly tweaking pieces around on the board, and this is compounded by the fact that it is single player, and so you are the only one taking care of all of this upkeep. The final con that I had for Nemo's War was that it felt unnecessarily complicated. And, I think that one of the things that would really help this would be to have a turn order cheat sheet that quickly told you what you needed to do (and what you were trying to roll on the dice at any given time). Most of this is present on the board itself, but it serves to clutter the board more than give you an easy reference of what you need to know. Since you don't have a clear cheat sheet, you have to refer to the instruction book that is essentially a 6 page wall of text. What's more, there are actions that you won't use in some games (or will use rarely), and yet to understand the game and get going, you still have to read through all of these. Specifically, the Incite action is completely worthless if your motivation is Science - Liberation (the track that you affect with the Incite action) is not worth any points with this motivation. There are also three different tracks that can affect the game at any given point. This adds to the confusion when initially learning the game, as you have to figure out how much you care about each of these tracks. 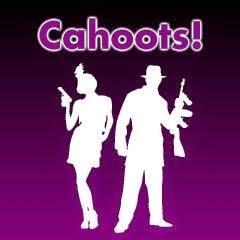 Finally, here's something that you should be aware of about Victory Point Games' games. They all have inexpensive components. Their company motto says something about the fact that they focus on gameplay instead of components. I can appreciate this, and I knew it going in, so I wasn't disappointed when I got the game. I don't consider this a con - I'm simply mentioning it here so that you will realize what you're getting if you buy one of their games. Overall, I give Nemo's War a 7.0/10. The game worked, but I didn't find it exciting enough to keep drawing me in to play it repeatedly. And, with it being solo, there won't be other people asking me to play it. 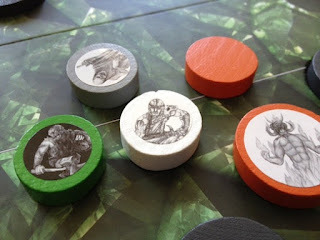 If you like literary based games, you might also check out Beowulf: The Legend and Lord of the Rings: The Card Game (which can also be played solo). I would like to thank Victory Point Games for providing me with a review copy of Nemo's War. 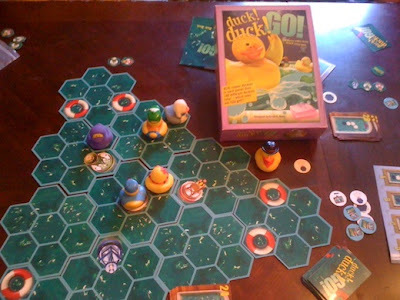 One of the games that was generously sent to me after the tornado was Duck! Duck! GO! . In Duck! Duck! Go! each player takes on the roll of a rubber duckie that is racing around the bathtub. His goal - hit all three buoys and then cross the finish line (go down the drain). But you must be careful, because the blasted bird dog is hunting you down, and if he catches you, you will be sent to a life preserver! What this actually means is that each turn all of the players pick a card from the three in their hand and reveal it at the same time. The players then move in order from lowest to highest on the card (thus allowing the lower numbered cards to get in the way of the players with higher numbered cards). If you cross a buoy, then you get the marker to represent that, and you also get a special bonus power that can be used once per game. If you run into another player or a wall, your ducky turns completely around and faces the other direction. After everyone has moved, the player in last place gets to move for the bird dog (trying to catch his opponents and send them back to life preservers). Play continues like this until one person has collected all of the buoys and crossed the finish line. The first thing that I like about Duck! Duck! Go! is the rubber duckies that are included in the game. My understanding is that there are over 100 different duckies that you may get and that each set is (probably) different. I think that this is a brilliant marketing strategy, and is also just a really cool feature of the game. Most of the people I played with (granted, they were women) loved the rubber duckies, and they didn't even necessarily care if there was a game associated with it. And I must admit, I thought that the duckies that were in our game were pretty cool! The next thing that I thought was neat was that the life preservers served both as starting locations and as "teleporters." This could really help if you found yourself horribly out of position and facing the wrong direction, as it was a much faster way to re-orient yourself than the other alternatives (continuously running into walls). The next thing to mention is that I think that the designers of Duck! Duck! Go! did a wonderful job of depicting what it would be like to have a rubber duckie race. Imagine filling a bathtub with water and then racing rubber duckies by using a squirt gun to move them around (which, the more I think about it, sounds very fun). Now, imagine that you're not allowed to move around the bathtub but must always shoot the duckie from the same angle - and how frustrating it will be when you hit a wall (and get stuck on the wall and spend five minutes trying to get off of the wall). 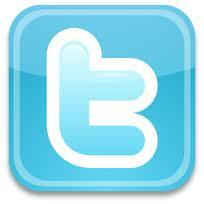 They have captured both the difficulty of movement and the frustration that you would experience very well. Which leads to my biggest con for the game. I never have the cards I need! As I just stated - they capture the frustration of trying to move your duckie very well. Each time that we played I found myself running into walls because of the cards that I had (and because I was very bad at the game), and getting more and more frustrated by my complete lack of ability to move. I would chase down a buoy and have everything set up to where I would successfully be able to capture it. Then, one of two things would happen - I would have read my card wrong (that happened a lot; I thought I was better at spatial reasoning than this) or another duckie would get in my way and throw the whole plan off! Whereas I think that this is what a lot of people will love about the game, it was incredibly frustrating to me! Another thing that I thought was odd, though I'm not entirely sure that it should be a "con" was that running into another ducky only affected your ducky - not both. If you ran into another ducky (or the wall) then you were completely spun around and facing the opposite direction - and their ducky remained intact. I really felt like both ducks should be affected - but that would drastically change the strategy of the game (as you wouldn't want someone to run into you most of the time). Overall, I give duck! duck! GO! a 6.5/10. I think that a lot of people will like it better than I do, and I am glad that I had the opportunity to play it - but rest assured, I will pass this game along to someone else to try to help after the tornado. I think that it will find a better home in someone else's hands. If you like duck, duck, Go! then you might also be interested in Gubs, Micro Mutants: Evolution, and Carcassonne. After hearing nothing but good things, I decided that it was time to hunt down a copy of Catacombs. So, let me confess - I love dexterity games. I really enjoy PitchCar, Crokinole, Clout, and many, many others. And, as much as I love PitchCar, I don't really need to buy another game that does the exact same thing (though I have bought two sets of the base game). Fortunately, Catacombs really has a different feel than any other dexterity game that I have ever played. Between having different characters with different abilities, monsters that deal you damage, items that you can purchase, and even having the ability to be incapacitated, Catacombs truly gives you the feel of a dungeon crawler, but one that appeals to dexterity fans. My next pro for Catacombs is that I like how they set up "obstacles" in the different rooms. The game would be fairly boring if each turn the heroes and monsters setup on opposite sides of the board from each other and just shot directly at one another. Fortunately, in Catacombs, each room has 5-6 "obstacles" (large grey disks) that represent various formations (whether pillars, or stones, or something else) in the room that monsters and heroes can hide behind. These obstacles aren't in the same place in every room, either - there are 3 different boards, each with the obstacles in different places; and each board is double sided (which flip the start zones) so that there are 6 total obstacle configurations. I thought that the entire concept of having obstacles in the room was brilliant, and it really adds to the enjoyment of Catacombs. With all that I love about Catacombs (and, really, I do love the game), there is one major nuisance in it. Disks go flying off the board all of the time. I really think that this game would be ideally played in some kind of enclosed board, where all of your excess disks would be caught - possibly on a pool table (but where the pockets are filled in). Plus, when a disk goes flying off the board, you are supposed to place it back where it left. Right - this actually turns into where your best guess is that it might have left the board because, ultimately, you might have no idea. But, that's ok - as long as everyone is playing the game for fun, I think that this con will not hinder your enjoyment. Ok, maybe there are actually two major nuisances. The second one is that it is really, really hard to tell what each disk hit after a shot. When three or four disks are clumped together, and you shoot a piece into the group (hoping to hit several of them) and they all go flying, it's very difficult to determine which ones were hit directly (thus damaged) and which ones were hit indirectly (which does not deal damage). If you're playing with someone ultra-competitive who isn't willing to realize that this is a game and should be played for fun, this can be incredibly frustrating. The last thing I will mention is this - when flicking, it might be a good idea to have someone else hold the gameboard down. I have actually watched people flick the board while playing. Their disk was towards the edge of the board, and they missed their disk entirely and moved the whole board about 6 inches (and essentially caused a giant earthquake in the game). I laughed at them for doing this, but then a few minutes later a different player did it again!! I have not done this, so I am going to continue pointing fingers at them and laughing (not really) when they do this.... at least until I do it myself. Either way, it's something that you probably want to be aware of, so that you can avoid this problem. Overall, I give Catacombs a 9.0/10. I love dexterity games, and this one gives me a fresh new feel on a genre that I love. Well done. 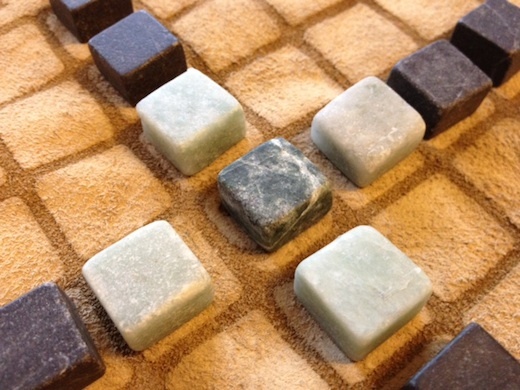 If you like dexterity games, you should check out PitchCar, Caveman Curling, and Fastrack. 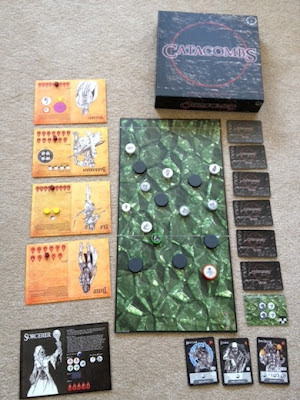 I would like to thank Sands of Time Games for providing me with a review copy of Catacombs. Hello, friends, and welcome to Nightfall review #4. This one is of.... well.... the 4th set - Nightfall: The Coldest War. As with most of my expansion reviews, I will assume that you are already familiar with the base game. If you're not, I highly recommend checking out my review of Nightfall, so that you'll have a context to frame this discussion, as I only plan on writing about the changes that Coldest War has introduced. The first, and most widely advertised, thing that Coldest War introduces is the "Moon Phase." Essentially, there is a new deck of about 6-8 cards that represent different phases of the moon. Based on which phase of the moon is currently active, a different global effect will occur. 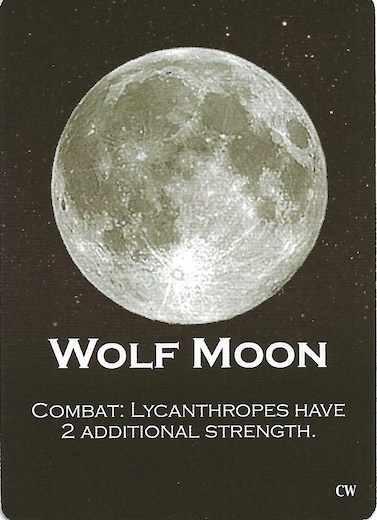 Some of these will make lycanthropes stronger, others will help vampires, one causes all kickers to resolve. But, for the most part, these phases target a specific race of monsters and make that race stronger in some way. And, if that isn't a race that you have a lot of in your deck, then at the end of your turn you have the option of changing the phase to be something else. Honestly, I found this element of the game to be fiddly and unnecessary. Since most of the phases only worked based on the class of your monster, it generally seemed to be an afterthought to get the bonus. You definitely couldn't plan a strategy around the moon, because it changes too often, and it's possible for the phase that you want to never come back up. More than anything, this element felt like something they tacked on just to have something "new" in the game. Fortunately, it is optional, and I will probably opt out of using it 98% of the time. The next new addition in Coldest War are Combat effects. Combat effects are cards that you can play during any combat phase, and they give you a bonus. This is nice, since inevitably you will not be able to chain every card in your hand every turn. Most of these bonuses aren't large enough to be overpowering (give a minion +1 strength, heal a minion, etc), but it is nice to have an alternative way of playing cards. My favorite Combat effect is the minion that is able to be put into play from your hand, but with only one health. He then becomes a nice surprise attack to your opponents. Whereas I was a bit torn, because it almost felt like cheating to be able to gain effects from your cards without successfully chaining them (chaining is the crux of the game! ), I do like the new Combat effects, and they help the Coldest War expansion to have a different feel than the previous sets. This is a nice addition. The third thing that I will mention isn't really a new addition, but is really awesome. I love the new wound cards. It's worth mentioning - Coldest War is a standalone set. Yet, instead of giving you all "new" wounds, Coldest War gives you wounds of each of the existing types. This can be a bit confusing when you first look through the set and see "Martial Law" written on some of your wounds, but it really makes sense when you think about it. Anyway (drumroll....) the new wound effect is: "This card chains to and from any card. This does not count toward your 1 wound effect per turn limit." That is amazing! Suddenly, I want to get hit a few times, because I'll be able to chain on any card on any turn (assuming that other players start a chain). However, because of the final part (not counting towards your 1 wound effect limit) it makes sense to include the other kinds of wounds - otherwise the Coldest War set woundn't make sense without being mixed with the other sets (and, after all, it is supposed to be a standalone expansion). So, yes, I love the new wound effect. I like it more than any of the actual archive cards I've seen in the set! The final thing that Coldest War mixed up on us was the starting decks. Nightfall and Martial Law each had the same starting decks. Because of those starting decks, the first few turns always felt a bit too prescribed (you start off by playing Yuri, because he gets you extra influence). This is no longer true, and the starting turns feel a bit more fluid - though, that might simply because I'm not as familiar with these new minions, so I haven't found a "go to" strategy. Honestly, in some colors I like the original starting cards, whereas in other colors I like the new ones. The most interesting one is "Snowstorm", whose strength is dependent on how many minions the defending player has (if you play this early when nobody else has any minions, you completely wasted your card). Though none of these new starting cards are incredibly unique or special, I like that they were included, as it provides more flexibility with the starting game. Now, you can use the old set, the new set, let each person pick which set to use, or even let each person mix and match from the different sets. I hope that they continue providing different starting decks in the future! Now, just because it's fun, here's my (current) favorite card from this set: "Bone Cruncher." 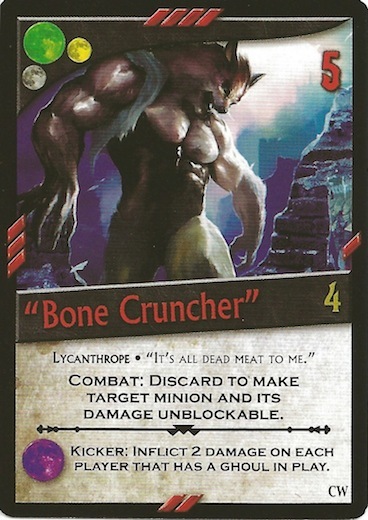 He is a Lycanthrope (this actually matters now, but still not much) with 4 hitpoints, and he deals 5 damage! Plus, he has a Combat effect that lets you make a target minion's damage unblockable. Awesome! Can you just imagine having a handful of these in your deck? You play one on the table, then discard another copy from your hand to make the first one unblockable - all 5 damage! Overall, I give Nightfall: The Coldest War an 8.5/10. Whereas I still like the base game significantly more than this one, because of the new wounds and starting cards I think that The Coldest War is at the top of my list of Nightfall expansions. If you like expansions, you might also check out (of course) Nightfall: Blood Country, but also Bang! Dodge City, and Thunderstone: Dragonspire. 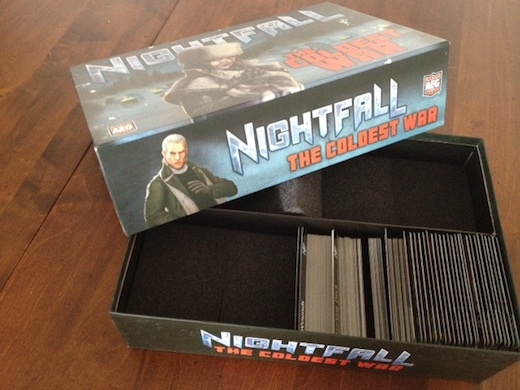 I would like to thank AEG for providing me with a review copy of Nightfall: The Coldest War. So, let's be honest for a minute (before I resume lying to you (not really (ok, I'm lost now (too many parenthesis!))))... I didn't ask for Kingdom of Solomon - I asked for the Manhattan Project. Minion Games offered my Kingdom of Solomon instead (they were out of Manhattan Project), and I figured I would give it a shot. After reading the rules, I really didn't expect much, but sometimes a game is a quite pleasant surprise, and this was one of those games for me! In Kingdom of Solomon, the players are each trying to help provide resources to build the temple of Solomon - well, and other buildings in the Ancient Near East (some players might ignore building the temple). 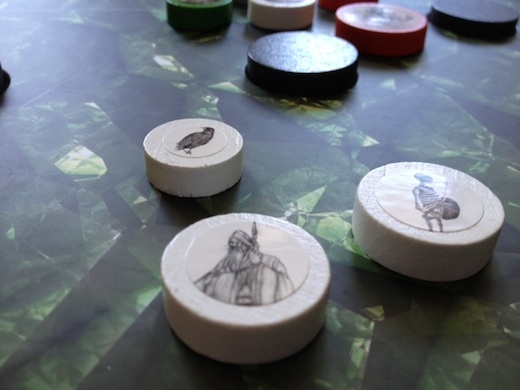 Each turn, players will alternate placing their workers onto various spaces on the board. After this, they will each collect all of their resources (or any other bonuses) in turn order. Third, (in reverse turn order) they will alternate turns buying and selling goods from the market, using victory points as currency. Finally, they will each have the opportunity to build one building per turn (in addition to as many sections of the temple as they choose). After one player has built five buildings, the temple is completed, or once all 11 building locations on the map are filled, the game is over, and the person with the highest victory point total wins. Sound like every worker placement game that you've ever played? Yeah, I thought so - but keep reading, and you'll see where this game stands out among the crowd. The first thing that I really enjoy about Kingdom of Solomon is how roads work. Each time you buy a building (except buildings with a "no build" icon), you get two bonuses. First, the building card is an action space that only you can place a worker on. Neat. Second, you get to place a building on the map. The region where you place your building can now only be claimed by you (or by the high priest (you get this title by building the temple a lot (lots of parenthesis today!))). What's more, you can connect regions by building roads - when connecting, you can only connect regions where you have a building or that do not have a building foundation (an empty place where a building could go). It's also important to note that you cannot use your opponents' roads!! If you miss this, it can terribly skew the game. Once you have these roads in place, any time you collect resources on any of the regions that are connected, you collect resources for every resource connected to it. Roads are powerful!! Instead of collecting 1-2 resources with a worker, if you gain a large enough "super" region, you can collect 8-10 resources or more! And, if you place a worker on each region in this "super" region, you can collect that repeatedly! Thus, preventing your opponents from having resources available. Reading through the rules, I did not realize how powerful roads would be - but they wound up being my favorite aspect of Kingdom of Solomon. The next element that I thought was unique and innovative about Kingdom of Solomon was the "super action" spaces. There are three of these action spaces on the board, and in order to claim that space, you have to play all of the workers you have left for the round. This is a really neat push-your-luck against your opponents element. And, the payoff makes the spots definitely worth acquiring. My concern, though, was that this would make the game really fun with four players, but not as good with two (you only use one of the spots with two players). However, the action that is available in two players allows you to become the first player. Because of the roads and the sheer number of resources that you can gather on a single turn (and this becomes even more prevalent with two players), being the first player can be vital; so this space is definitely crucial. 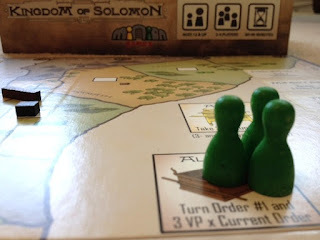 The final pro that I will mention is that Kingdom of Solomon plays very differently based on the number of players, but I enjoyed it with each number I played. With four players, all of the "super" action spaces are available, and so more fortune cards will be in play. Plus, with more players building buildings, it is more difficult to grow your "super region." However, with two players, there is only the one "super" action space available, and it very well may be ignored for half of the game. Yet, when people start growing gargantuan "super regions", players will be fighting over going first, simply to guarantee that they get resources! And, though at first glance the market seems to be useless in two player (you're allowing your opponent to get resources), once you have hordes of extra resources, it will only make sense to sell them in bulk at the market and get dozens of extra points (and your opponent will have to lose points in order to buy them). 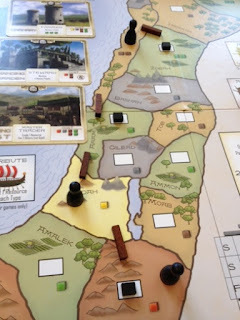 Ok, the very brief, last final pro, is that I'm glad that Kingdom of Solomon was built with a Jewish and/or Christian theme, and yet wasn't lousy. All of the previous "Christian" games I have played are horrible (here's looking at you, Redemption), or were just spin-offs of Trivial Pursuit with Bible questions. I'm glad that Kingdom of Solomon is neither of those. With all that is right with Kingdom of Solomon, I would say that the biggest con is that the rulebook is not very clear about several things. Every game I have played, and every person that I know of who has read the rules, has had questions that we had to guess about. Here are some of mine: When are roads built? How many are you allowed to build per turn? Do building cards that do not place buildings on the board count towards the 5 building end of game trigger? Is the number in the top center of the building card victory points (there is no diagram)? Is your "super region" able to connect through regions, or does it only use the immediately adjacent regions (the example only connects to adjacent regions)? The rules are very concise, which allows you to start playing the game very quickly - but, unfortunately, they are concise at the cost of clarity. Overall, I give Kingdom of Solomon an 8.5/10. It was one of my more pleasant gaming surprises of the last year or so, and I would recommend that you give it a try! If you like worker placement games like Kingdom of Solomon, you might also check out Alien Frontiers, Le Havre, and Stone Age. 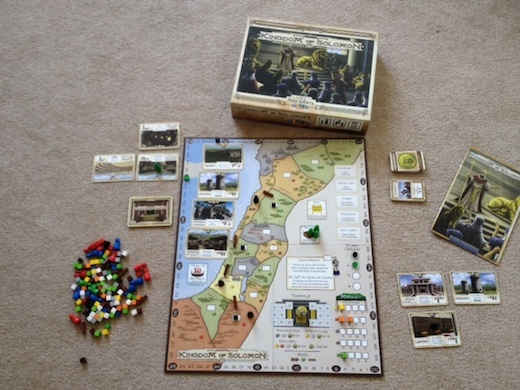 I would like to thank Minion Games for providing me with a review copy of Kingdom of Solomon. 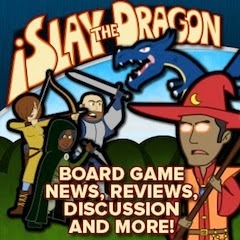 So, recently on BoardGameGeek, I was asking people to recommend to me 30-60 minute long games. I discovered that these are the easiest games for me to find time to play, and one of the ones that came pretty highly recommended was China. As an amazing coincidence, shortly afterwards I was asked if I was interested in receiving a review copy of the game - sometimes life is just brilliant like that! China is all about the victory points. I think that, thematically, you are trying to gain the Emperor's favor, be the Emperor, or something like that - it obviously doesn't really affect the gameplay or I might remember a bit better. China is driven by a 3-2-1 rule. You can play up to 3 cards per turn (if you spend two of them as wilds). You can play up to 2 pieces per turn, and those pieces have to be placed in 1 region. In order to play pieces, you must play cards that correspond in color to the region where you want to play (or use two matching cards as a wild). The two kinds of pieces are houses and emissaries. Houses score in a couple of ways - by having a lot of them connected in a road, and by having several of them in a region (more on this later). Emissaries score by having the majority of them in a region as well as in an adjacent region. The game continues until either the draw pile has been exhausted twice or no more legal placements are allowed. Then, it's back to being all about the victory points - tally them up, and the player with the most is the new Emperor... or made him happy... or something. But, they win! My favorite part about the game of China is the scoring. House scoring is unique, to say the least. Once a region is filled (or at the end of the game if the region is never filled), all of the houses in the region are scored. The person with the most houses gets points based on the number of total houses in the region. The player with the second most houses, scores points based on how many houses the person with the most controlled. Third gets points based on second place's houses, and on down the line. This is by far the strangest (this is the less polite word for "unique") scoring system that I have ever seen - and yet, I really think it is fabulous. It works very well, and it forces players to balance their play. Yes, it's still the valuable to have the majority in a region, but not by placing large numbers of your own houses in a region - you do the best when a lot of different players place houses, and you are able to get the majority with 2-3 houses. However, if you decide to overload a region with your houses, such as by placing 5 houses in a region that can hold 6, then when the region is filled, you will get 6 points. But, whoever is able to fill in that last spot get 5 points - for placing one house! It definitely forces a player to rethink obvious strategies if they want to succeed. The third thing I will mention (that I'm somewhat undecided about still) is that there is an interesting rule in China - if there are no pieces in a region, then you can only place one piece in that region. This means that you cannot start off by placing a house and an emissary in a region. It also means that if you place a house in a region, the person after you can place two houses in that region. It is an interesting rule that really discourages a player from being the first one to play in a region - yet, I think that without it, the game would not be as balanced (and it would be boring if people started placing a house and an emissary in each new region). So, it winds up being classified as a pro. The final two pros that I have about China aren't necessarily about gameplay directly. I like that it is very fast to play, and that it (at least seems to) scale well with different numbers of players. The box claims that the play time is around 45 minutes, and in my experience this is fairly accurate, even in learning games (assuming someone has read the rules). 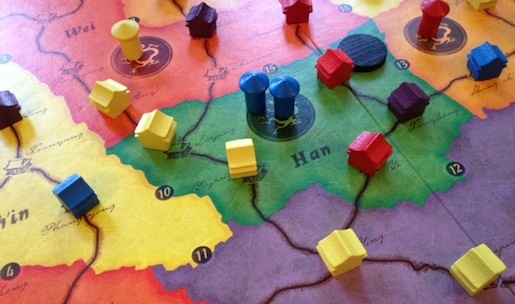 This makes China pretty easy to fit in at a game night, or even during lunch. Yet, the gameplay is very solid, and so you will feel satisfied at the end of it. Plus, the game can be played with 3-5 players, and I think that it will play well with any number of them. 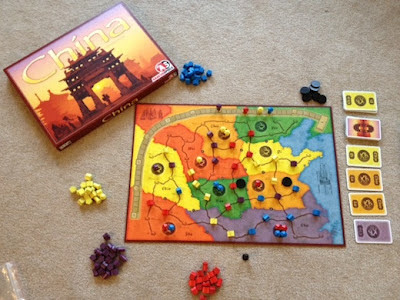 The board is two sided, providing a map on one side for 3 players, and on the other a map for 5 players (with 4 players, you can use either side). The biggest con that I encountered with China was that one of the rules is ambiguous, and yet can be crucial. In one game I played, most people were playing houses, and I started placing emissaries instead. I quickly got the emissary majority in a few connected regions, because I was the only person bothering to place them. Yet, as I started running out of emissaries (preparing to place houses again), I realized - "oh no, all of the housing spots are about to be filled." Sure enough, all of the house spots became filled, and I was out of emissaries - I could not play. Ok, now what happens? We looked it up - "The game also ends when no pieces can be played any more." Ummm... ok? It was my turn, and I could place "no pieces any more." Does that mean it's over? Other people still have pieces they can play, so it's not true that "no" pieces could be played - just none of mine. I looked for an FAQ online, and we did not find one. So, we decided that it was the end of the game. And I won (since nobody else had really started placing emissaries), but we didn't really feel happy with the conclusion, since we have no idea if we interpreted that correctly, or if I really had a bad strategy all along and should have accounted for the lack of possibilities that I was about to encounter. The rules were provided in several languages, so perhaps if we spoke any of them, it would have been less ambiguous. But, alas, I only speak English (one of the ladies I played with speaks Spanish fluently, but Spanish was surprisingly not included). Overall, I give China an 8.5/10. I was very, very tempted to give it a 9.0, because it truly is a very good game. But, for whatever reason I don't love it quite that much - and my numbers are fairly ambiguous and feeling-centric anyway, so we'll go with an 8.5 for the purposes of this writing. If you like games like China, you might also want to check out Chicago Express, Furstenfeld, and Princes of Florence. 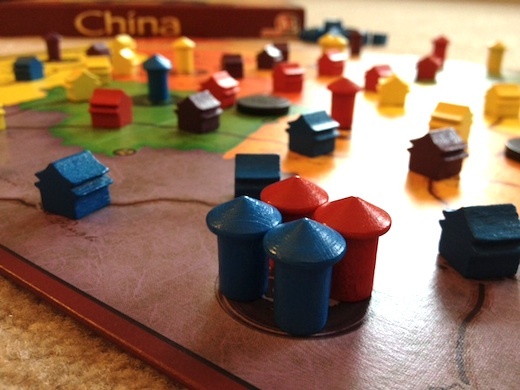 I would like to thank Eagle/Gryphon Games for providing me with a review copy of China. Yes, I know that the box says AbacusSpiele - this is apparently one of life's mysteries. A game that came to me highly recommended by some of my fellow bloggers is Existenz: On the Ruins of Chaos (not currently available on Amazon). I was told that because I liked the Game of Thrones: Living Card Game, I should try out Existenz. However, I found Existenz to be much more like Magic: The Gathering. If you're familiar with Magic, most of this will sound familiar, but I'll go ahead and give an overview for anyone else. On your turn, first you re-activate (untap) all of your cards, you draw a card, and then you can play cards from your hand. 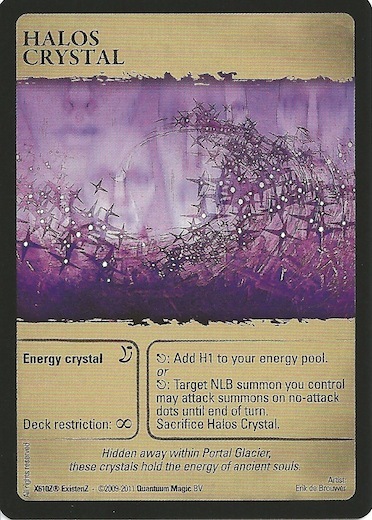 You may play one Crystal (Land) per turn - these give you Energy (Mana) which you can then use to play other cards. You can play Summons (Creatures) from your hand, and there are about six different types. You may only have one summon of each type in play at a time, and it must be summoned onto either a warp dot or a start dot. 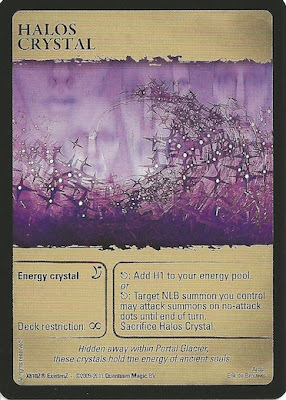 There are also Catalysts (Enchantments) that can be played that affect gameplay, and Flux (Instants) cards that can be played at essentially any time, but are discarded after use. On your turn, you may move and attack with your Summons, as each has a speed and range - all damage they inflict goes onto the targeted summons, and once a summons takes more damage than it has defense, it is destroyed (think of defense as hit points instead of damage they can prevent). The game is played until one player's Life Base (a summons type that starts in play) is destroyed, reaches an end dot, or one player runs out of cards in their deck. The first thing that I like about Existenz is that, through the board, it adds a spatial element to Magic. Instead of everything being in some ethereal realm where everything is conveniently adjacent, summons actually have to get near each other in order to fight. This makes sense. However, one of the rules is that you cannot move over "sharp turns" (acute angles). This is a really neat mechanic, and allows for the board to not require tons of icons representing when you can and when you cannot move (though the board is still pretty busy). However, it also makes most creatures' movement speeds not matter very much, and it also makes the combat much less frequent - especially considering that you're only allowed to have a few summons in play at any given time. The biggest pro to Existenz is probably that the publishers of the game are listening to their fans. Specifically, the game was initially launched as a Collectible Card Game (where you have to buy packs of random cards). In fact, the back of the instruction manual encourages you to buy extra packs in order to expand your gameplay. Their fans apparently hated this (I can't blame them, I hate the CCG model, too), and so they have changed it to the "Living Card Game" model, where you still buy packs, but the packs are not random. I appreciate any time that a company listens to their fans like this, so kudos to X610Z for doing so. Now, there are a couple of things that I need to mention before moving on to the cons - these are just points of note. First, my copy was mis-packaged. I had four decks, but two of them were the same (though the boxes for each were different). I have contacted the publishers, and they are fixing the problem - but this is something to be aware of, as I don't know how prevalent this problem was. Secondly, as I said before, this game is very similar to Magic. I don't know why this is - I don't know if the designer was trying to "fix" Magic, if they were trying to appeal to Magic fans, or if this really is a giant coincidence (this is my least likely scenario), but I don't think that anyone who has played Magic more than twice will see this game without immediately making the comparison (and, in fact, when I teach the game to Magic players, I teach what is different, instead of the full rules). Honestly, though, my biggest frustration with Magic is the mana system (I inevitably draw too much Land or not enough), and so I don't understand why Existenz kept this flawed mechanic! This is a Crystal - yet no colored background on "H1"
Now for the cons - first, the game is hard to visualize. There are several elements that go into this. 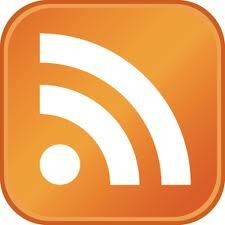 First, the iconography is both bad and inconsistent. Instead of having an icon to represent what type of mana you need (again, like in Magic - maybe I'll stop this reference soon), energy is represented with a letter and a number, and sometimes this has a colored background, but sometimes it doesn't. The inconsistency of the coloring makes the coloring essentially useless. So, you have to remember what Crystals gain H, B, R, and M. There is also a "C", which stands for Colorless - this is not intuitive, though, as it has a white background, and the cards don't all show the background color for Energy. In our first game, one of the players kept hoping to draw a Crystal that would give him "C" Energy. Also, the cards in general just seem very busy so that it is hard for me to quickly see what I need to know at any given moment - I don't know if this is because of the layout of the card itself or because I have not played it enough to be accustomed to it. I would guess that it is both. The next thing that adds to the difficulty in visualization is that all of your summons are represented on the board with a marker that shows their summons type. However, when looking at the board, because of the "sharp turn" rule, it takes a few moments to see what can attack and where. 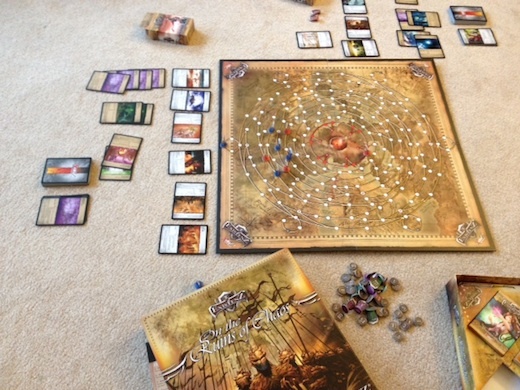 Next, you have to figure out where each card is on the board - and then what your opponents pieces represent. Nothing intuitively associates any given card with something on the board. Part of this might be more iconography problems - instead of my card saying "dragon", and then having a picture of a dragon on the playing piece, maybe both the card and the piece should have a picture of a dragon. Ultimately, I'm not really sure how to easily fix this problem, but it definitely caused us to have confusion when we were playing. One of the biggest cons that I found is that there is a strategy that makes the game horrible. I haven't played it out enough to know the full ramifications, however. Surrounding all of the "start dots", there are "no attack dots." A summon (including your life base) cannot attack or be attacked while on these dots. So, here's a basic strategy - don't move your life base off of the no-attack dots. Sure, you're not going to win by having your life base reach an end dot, but if you kill your opponent's life base, you win just the same. And he can't kill yours! However, envision what happens if both players use this strategy - nobody can attack their opponent's base. So, you are basically playing the game until someone runs out of cards! I will confess that this isn't entirely true, as there are some cards that allow you to attack a summons that is on a no attack dot, but I think that these cards are infrequent enough to cause this game to be wretchedly boring if two players decide to use this incredibly basic strategy. The last couple of things are that the basic decks aren't very basic, and some of the rules seemed a bit artificial. In Magic terms, each of the starting decks was a "three color" deck - this means that in order to play all of the cards in your deck, you had to have three of the four different kinds of crystals in play. This really makes the decks slow - though fortunately, there are several Crystals in the deck that can give you two types of energy. When it comes to artificial rules, the "sharp turn" rule, though neat, doesn't really seem to make much sense to me thematically. Also, the fact that you can only have one summons of each type seems to be because otherwise you couldn't tell which piece on the board represented which summons, instead of having a thematic reason. This rule also means that you can't always play the cards in your hand - even if you can afford their energy cost. And, once you finally can play something (because you lost a summons), you have to play them on a warp dot or a starting dot, so they are horribly out of position for the fight that you need to reinforce (and because of the sharp turn rule, it will be several turns before they can get in position). Overall, I give Existenz: On the Ruins of Chaos a 6.0/10. There are definitely people that like it (that's why I tried it), but I'm not really one of them. But, don't just read my review and discard the game completely - check out what other people have to say and decide for yourself. If you like Magic, this game is worth trying, just to see the spatial element of the game, but for most people I would recommend trying Existenz before buying it. If you like games like Existenz, you might also want to check out Warhammer Invasion, Summoner Wars, and Game of Thrones: The Card Game. I would like to thank X610Z for providing me with a review copy of Existenz: On the Ruins of Chaos. A classic game that has lasted for centuries is Brandubh. 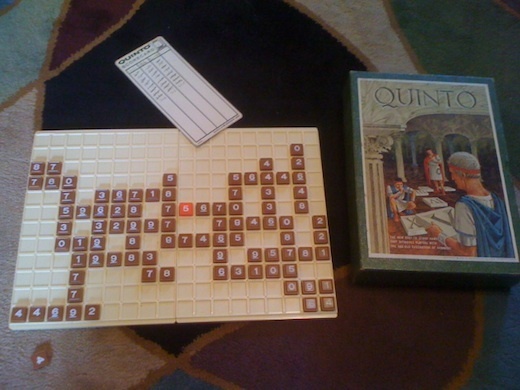 Brandubh is one of twelve games of Bibelot Games' "Reliquary Collection." This collection has taken many ancient board games and is re-printing them with very high quality components and packaging that provide you with a very easily portable, nice, yet ancient feel. Brandubh specifically, is from Ireland around 600 AD. If you're interested in learning more about the Reliquary Collection, check out their Kickstarter project - I think that they're worth backing. Also, as a final note, the pictures that I have provided in this review are of a prototype of the game, so the final product may look slightly different - but Bibelot has told me that they are not intending to change the look or feel. As I said, Brandbudh is a classic game like Chess or Go. 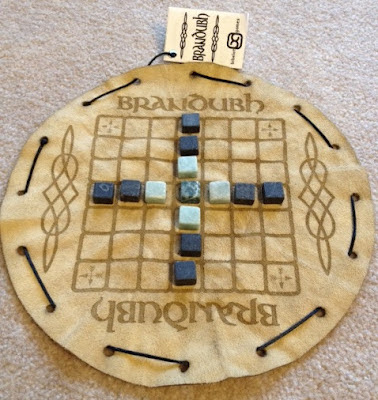 It is from Ireland around 600, and Bibelot Games didn't have to change or adjust any of the rules. Brandubh is the game of the Kings and the Ravens. 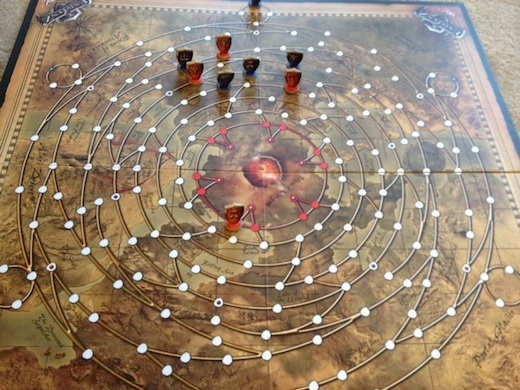 All of the pieces are setup in a cross, with the High King in the center. The Kings have a total of five pieces, whereas the Ravens have eight. 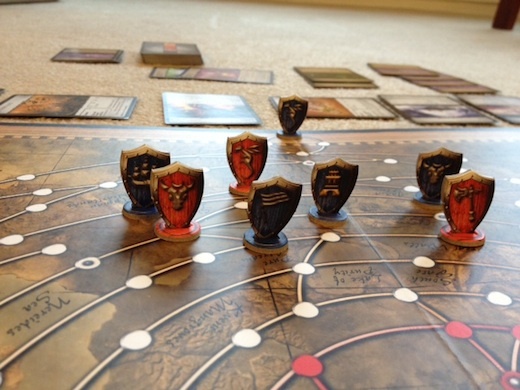 The Ravens are attempting to capture the High King by surrounding him on all four sides, whereas the Kings win if the High King successfully moves to one of the corners of the board. Each turn, the active player moves a single piece as far as he wants in a straight line. If, by doing this, he flanks one of his opponent's pieces (other than the High King) on opposite sides, then that piece is captured. Also, the High King is the only piece that is allowed to move into the corners or through the center. Players alternate turns back and forth until the High King has either escaped or been captured. 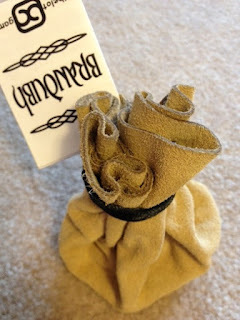 The biggest pro that I have for Brandubh (specifically the Bibelot edition of it) is that the packaging is amazing. It is packaged in a suede pouch that also lays flat to serve as the board. In addition, the pieces (they claim that they are marble, but I have no idea) fit very well with the age of the game and the ancient feel presented by the suede pouch. Overall, when playing the game, you really feel like this could have been how it felt to play this game hundreds of years ago, and it is just amazing that the game has survived for so long. I really hope that one of the things that Bibelot does with their project is to provide the history of each of the games, but I don't know how far along they are in the publishing, and so I don't know if this is feasible for the first printing. The next thing that I like about Brandubh is that it is actually a solid game. It is balanced, but not symmetric. The Kings have a much easier victory condition, since all they have to do is escape. However, the Ravens have a significantly larger force. I have seen both sides win, and whenever I have played it, I felt like the side I wasn't using always had the advantage - which I think means that the game is balanced well (and that I'm not very good at it). The game itself is fairly simple, so instead of more pros and cons, now I will just cover the basic strategy for both sides. With the Kings, the goal is to escape at all costs. It doesn't matter if any of your Kings other than your High King survives. You should use your Kings as blockers, setting up a section of the board for your High King to quickly be able to move through. Basically, just get your Kings in the way of the Ravens. In addition, since the High King is the only piece able to move through the center, don't be afraid to quickly switch directions. If the Ravens are blocking you on one side, it might be good to switch to the other side of the board, and try to get some of your opponents blocked by the center piece. With the Ravens, you have to capture the High King. Unfortunately, he has a lot of lackeys. Well, he has a whole lot less of them if you start capturing them. You probably won't win with the Ravens if the Kings still have all of their pieces - so capture them as often as possible. But, when doing this, make sure that the High King doesn't slip through your fingers. You have to strike a careful balance between capitalizing on every opportunity to capture a piece, but also being attentive to what the High King might be setting up as an escape route. Overall, I give Brandubh an 8.5/10. When talking to the people at Bibelot, they told me something along the lines of "we think the world is better with these games in it," and I would have to say that I agree. Not only the world, but my game collection is better with these games in it. It may not come as a surprise to many of you that I have "a few" games (I think it was around 300 last time I looked), and so many of the games that I play for this site wind up being traded after I review them. Brandubh I think will stay in my collection for quite a while, and I'm very eager to try the other games from the Reliquary Collection, so I wish Bibelot all the success in the world with their Kickstarter project. And, as a reminder, you can check them out here if you are interested in backing them in order to get a copy of Brandubh or any of the other 11 games in the Reliquary Collection. If you like Brandubh, you might also like Atlanteon, Hive, and Abalone. I would like to thank Bibelot Games for providing me with a prototype review copy of Brandubh.